James Della Pesca celebrates after a sack. Della Pesca will play key roles on both sides of the ball in 2018. Every football program has an identity. 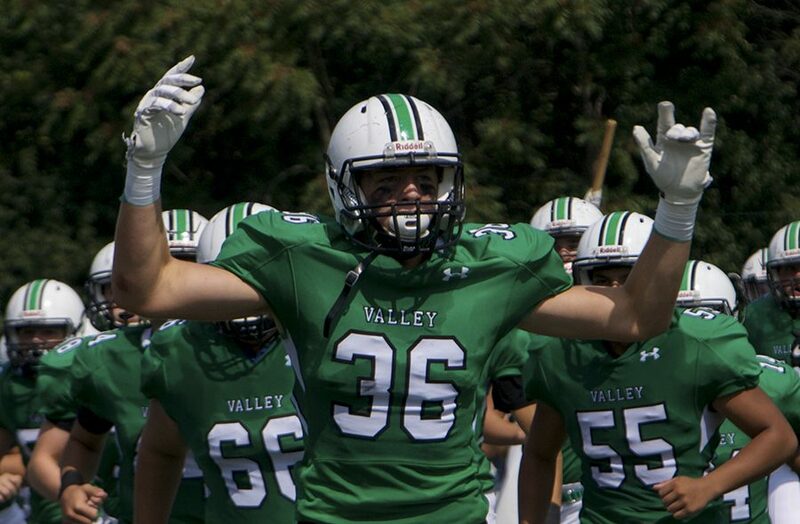 For Pascack Valley, that has long meant playing hard-nosed football with a run-first offense. This year promises to be no different. The Indians’ will lean heavily upon their ground game, lead by junior running back Jake Williams, who Cusumano described as “an absolute bull”. Last season, Williams rushed for 495 yards and 4 touchdowns. Williams and the rest of the Valley rushing attack will run behind a strong offensive line that returns four starters, anchored by three-year starters Charlie Looes and Andrew Demboski. Seniors Jesse Lagrosa and Dylan Driscoll will also start on the offensive line. On the defensive side of the ball, Valley will need to continue its success by putting pressure on the quarterback. 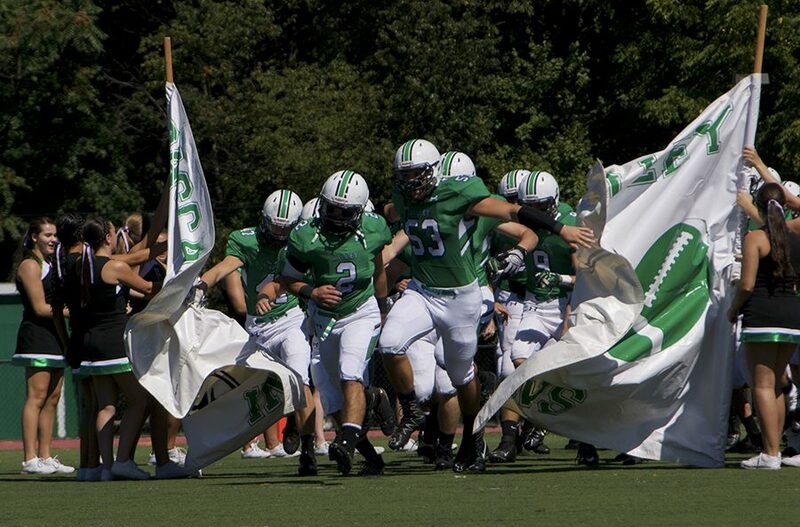 Looes recorded seven sacks last season, while juniors James Della Pesca and Joe Cuti each had two. On special teams, Jake Ciocca is “a tremendous weapon in the kicking game.” In 2017, Ciocca connected on 15 of 18 PAT attempts, while converting all four field goal tries. Williams, who Cusumano referred to as a “swiss army knife”, will handle the punting duties. Outlook: Despite a 2-7 regular season, Pascack Valley eked into the North 1, Group playoffs in 2017, thanks to its strength of schedule. Although they were bounced in the first round by No. 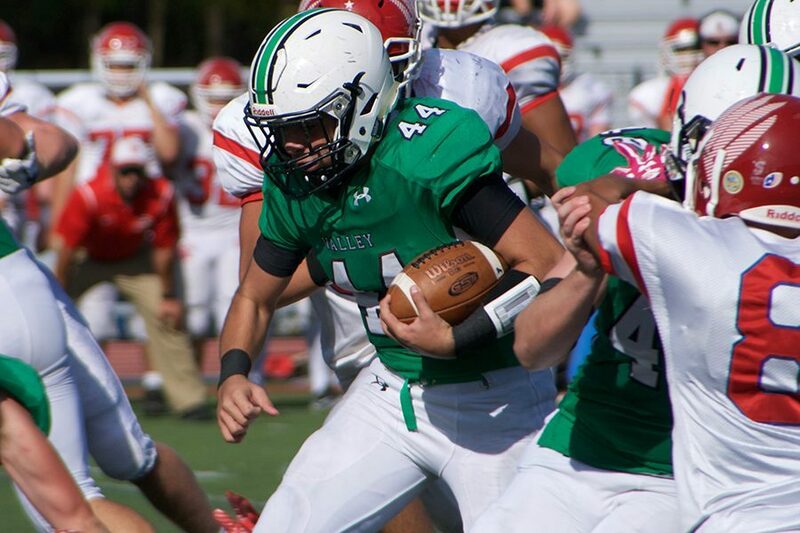 1 Ramapo, Cusumano believes that the opportunity to play postseason football has given “this rising group great confidence going into this season.” Cusumano believes that his squad “can play with anybody out there.” They will have to do just that if they hope to have success in the 2018 campaign, as Pascack Valley will once again face a litany of strong programs. The Indians will host NorthJersey.com No. 1 Ramapo and Connecticut powerhouse New Canaan, while road dates loom with No. 2 Old Tappan, No. 20 Paramus, and the defending North 1, Group 3 champ, No. 6 River Dell. Jake Williams carries the ball in a game last season. Williams will serve as the lead back for the Indians this year. When: Friday Sep. 7, 6 p.m.
Pascack Valley will open its 2018 season with a matchup against Dwight Morrow on Friday night at home. The Indians made the North 1, Group 3 Playoffs as the No. 8 seed last year despite recording just two wins, and now enter coach Len Cusumano’s third year at the helm of the program. Meanwhile, Dwight Morrow obtained the No. 6 seed in the N1, G3 playoffs last year and lost its first round matchup to Demarest. Last year, PV relied heavily on its running game in order to pick up first downs and score points. Expect a similar gameplan in the season opener, with Jake Williams, who ran for nearly 500 yards and 4 touchdowns a year ago, leading the charge. “He’s the epitome of a football player,” Cusumano said of his junior tailback. Valley will rely on Stephen Soravilla and James Allmers in the backfield as well. They will all run behind a strong, experienced offensive line that brings back four starters, including senior Andrew Demboski, a first team all-league nominee in 2017. At quarterback, PV will likely have junior Stephen Begen start for the second straight season. While the passing game probably takes a backseat to the rushing attack against Dwight Morrow, Begen has a number of viable targets to throw to, including James Della Pesca, Mike Garay, Ian Valdez, and Jake Ciocca. Defensively, PV looks to slow down a Dwight Morrow offense that averaged 27.4 points per game a year ago, albeit with a much more experienced roster. This year’s iteration of the Maroon Raiders will be much younger than the playoff team from last season. While Dwight Morrow does have a number of starters returning in 2018, many sophomores and juniors will see the field and play significant roles. That includes sophomore QB Jalen Hoyle, whose next varsity pass attempt will be his first after he only played running back and defense a year ago. The most accomplished player on the Maroon Raider roster is senior Jihad Edmond. Edmond, a two-way player at tight end and defensive end, racked up 294 receiving yards and 3 touchdowns on offense last year, while he also compiled 62 tackles and 6 sacks on defense. He has received multiple scholarship offers from Division 1 FCS schools, including Bryant University and LIU Post.